Nagata submitted Tsuji with the Nagata lock. Takagi pinned Narita with the Noshigami. Lance Archer pinned Henare with blackout. Sabre submitted Taguchi for the victory. EVIL pinned Honma with the Everything is Evil. Goto defeated Hikuleo with the GTR. Fale attacked everyone after the match as Chase Owens posed with the title. Another classic match between the two. I wouldn’t say it’s their best, but this was one of the better matches of the tournament so far. It was a mostly offense match and the crowd was into it. They start off hot, each exchanging blows once Ishii broke out of a clean break with a slap. They continue dealing with some hard shots. Ishii strikes back with some chops and offense of his own as he takes Okada into a corner. The two exchange elbows. Okada takes down Ishii but he gets right back up as soon as he hits the rainmaker pose. He fires with a lariat but Okada popped right back up with a dropkick. Okada hit the tombstone but Ishii blocked the rainmaker with a big headbutt/lariat combo. Ishii starts to fire back with some offense as the crowd gets hot. He looks for the brainbuster but Okada knees him. Ishii fires back with a forearm but eats an Okada dropkick. Okada went for the rainmaker but Ishii traps him with a straight armbar. Okada fights before making it to the bottom rope. Okada mounts some offense, hitting a shotgun dropkick. Ishii countered with a lariat but Tanahashi kicked out at one. Another brainbuster attempt, but Okada went for the rainmaker. Ishii headbutted him, but Okada still took him out with a dropkick. Rainmaker attempt again, but Ishii continues to fight on and cuts him off. Okada countered with the spinning tombstone then pinned Ishii with the rainmaker. I liked this match a lot, though it was tough to follow the previous match. They built up well and had a hot crowd that popped huge when SANADA pulled off the upset. Crowd was into SANADA tonight, leaving Tanahashi in the cold. SANADA took him down early, applying a leglock. They eventually go to the outside, with SANADA taking out Okada with a flying crossbody to the floor. Tanahashi comes back and goes for the cloverleaf, but SANADA makes it to the ropes. Tanahashi tries again, this time sinking it in. SANADA escapes, then tries the skull end. He send him flat as SANADA hits two moonsaults, but Tanahashi grabs him for an inside cradle and a near fall. Tanahashi goes for a slingblade but SANADA counters, only for Tanahashi to catch him in a roll-up. The two trade near-falls as Tanahashi goes for the dragon suplex. SANADA tried to swing him around for the skull end, but Tanahashi counters with two sling blades. SANADA floated over a Dragon suplex and went for a O’Connor Roll, but Tanahashi countered and went for the rolling clutch. SANADA grabs him instead and traps him with the skull end. Tanahashi struggles, but with no options has to tap out. 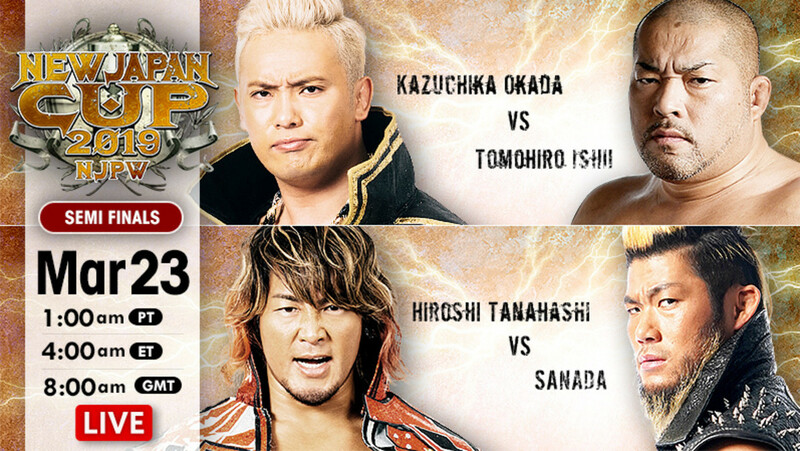 That officially makes it Kazuchika Okada vs. SANADA in the New Japan Cup finals. After the match, SANADA asks for the crowd to turn on their cell phones. The lights turn off, making the arena look like a Bray Wyatt entrance. SANADA says this is his favorite town, and he’ll see them tomorrow.